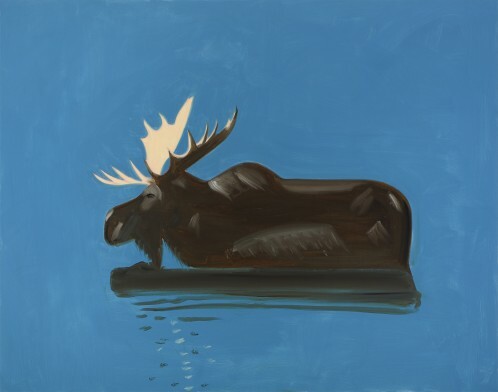 On the occasion of the 85th birthday of Alex Katz, the Essl Museum is currently showing an exhibition that features the artist’s major themes such as society, friends, family and landscape. Spanning a creative period of some 35 years, Alex Katz includes more than 30 paintings, as well as draft drawings, preparatory oil sketches and “cartoons”. Alex Katz developed his unmistakeable style in the midst of the dynamic New York art scene of the 50s and 60s. In 1949, just as he was finishing his degree, representatives of abstract expressionism such as Jackson Pollock were turning the New York art world on its head. Against the trend of the time, Alex Katz, however, decided on figurative painting. Influenced by elements of jazz and individual poets of the New York School, he wants to put a realistic subject into a concrete form. Coolness, technical virtuosity and the lyrical approach to everyday scenes are the starting points that Alex Katz also seeks to express in his paintings. A certain strictness paired with casualness is the aim. Katz endeavours to reduce his portrayals to the essential, primarily paints portraits, and so achieves the basic elements of the figure and the ground.